While we don’t actually own any (yet), we’re quite taken with the wonderfully efficient soil blockers. Recently I got to use them while helping plant a couple of thousand tomato seeds with some of our mates. When I say I ‘helped’ do this, I really mean I mostly played with my 1 year old niece while my mates planted them. I did actually do some work, for at least 15 minutes – but I’m not sure that really counts. But hey, I was there, did some blocking and I liked it, really liked it. Here’s the low down on why. 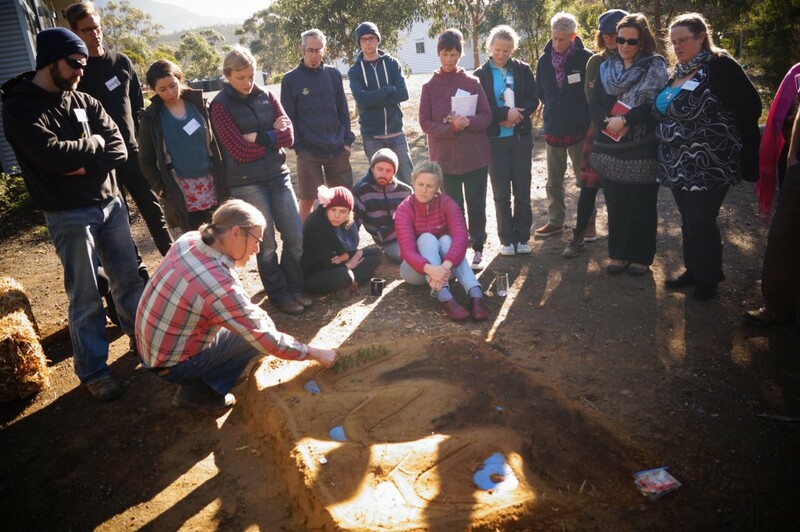 Soil blocking is exactly what it says it is, where you make blocks of soil of varying sizes. To do so you use the very cool contraptions shown below. The smallest on the left if the one you usually start with (depending on the plants you’re growing) where you’re providing the seeds with just enough soil, space and nutrients to get started. Once they’ve poked their heads up and have two or more leaves the blocks are ready to be upgraded to the next size block. But unlike the usual transplanting methods which can be a bit (or a lot) disruptive to the seedling’s root system this technique is seamless. You simply pop the whole block into the next size block as you can see below. This means there’s no stress caused to the seedling and the root system can continue on it’s own merry way, expanding into the additional space provided. The blocks are like babushka dolls, where one fits within another which then fits within another…. Image from here. Another cool thing about this method (there are quite a few) is that there is no chance of the roots getting ‘root bound’ which is a common occurrence when seedlings are left in containers too long. 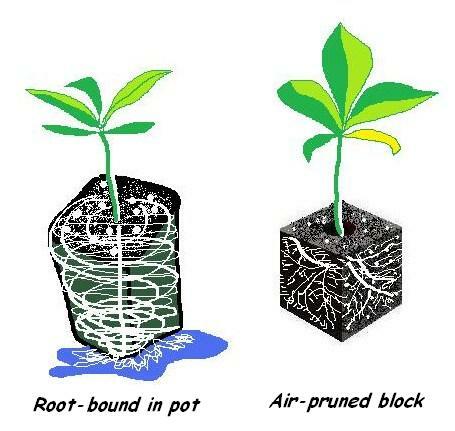 Instead, the roots are ‘air pruned’ which means once they reach the boundary of their soil block, air prunes them from going any further, so they can develop a healthy, naturally shaped root system. 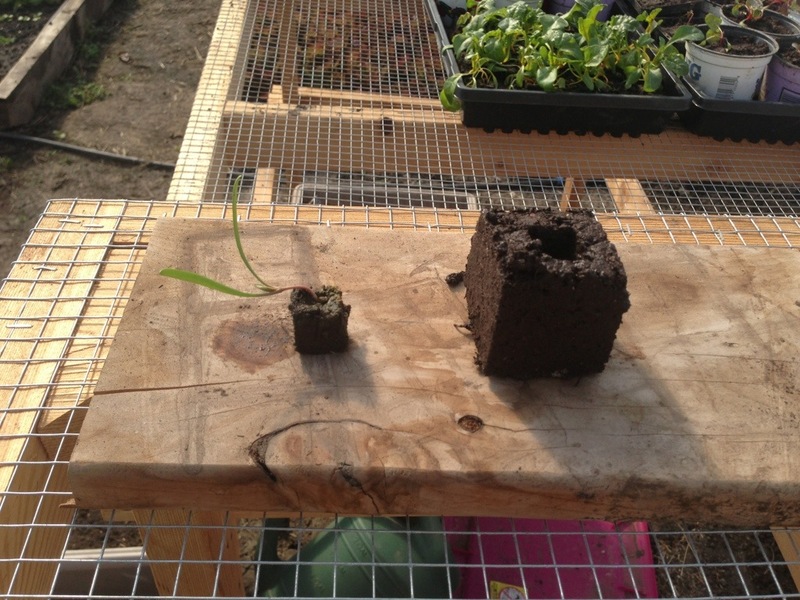 A root bound seedling on the left – a common ailment of leaving them too long in containers and seed blocking showing a healthy root system forming which has been air pruned. Image from here. But lets backtrack a bit to the very start. To make sure your blocks have good ‘form’ and don’t crumble, you have to get the soil mix bang on. 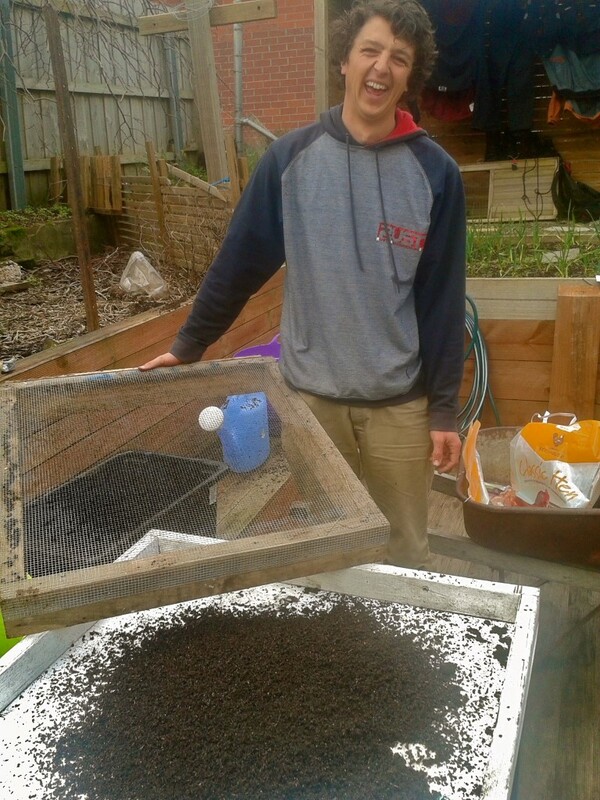 We made a mix up with the rough ratios of 3 parts worm castings (you can also use good compost), 1 part sand (river sand) and 1 part coco peat (coconut fibre). 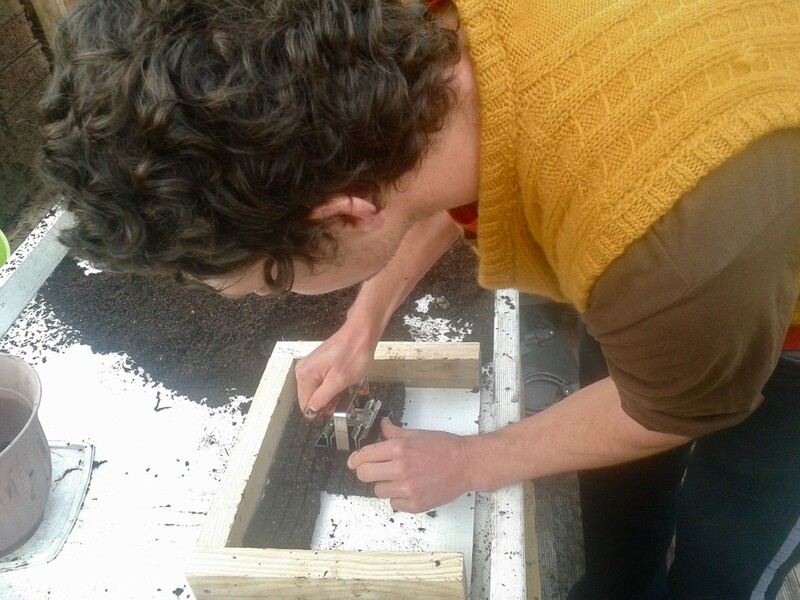 The worm castings are the ‘glue’ to the mix making sure the whole thing holds its shape, the sand provides drainage and air pockets while the coco peat does a brilliant job at holding moisture and nutrients in the block. The mix needs to looks crumbly and when you squeeze it tightly there should only be around one drop of water coming out of it, no more. 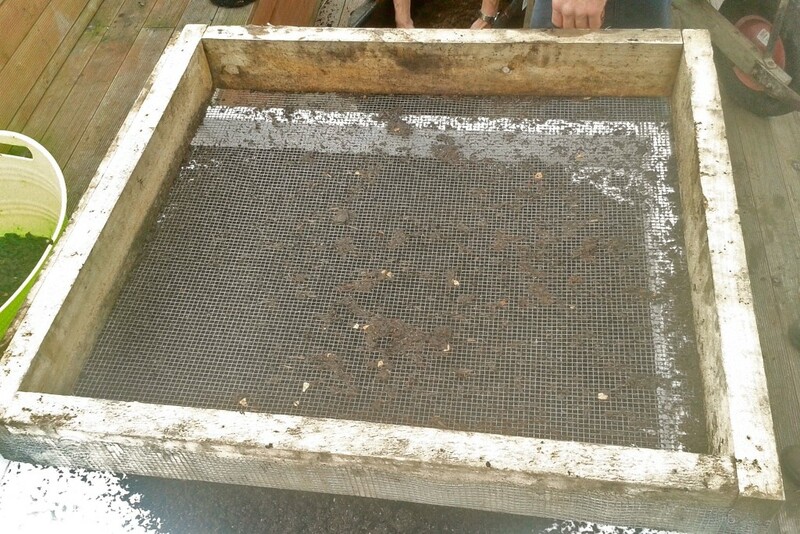 We use this great sieve do screen the mix, removing any bulky items and making sure there’s good ‘fluff’ factor. It’s made from timber lying around the garden and vermin mesh. Once the mix is ready to go you can get going on your blocking. 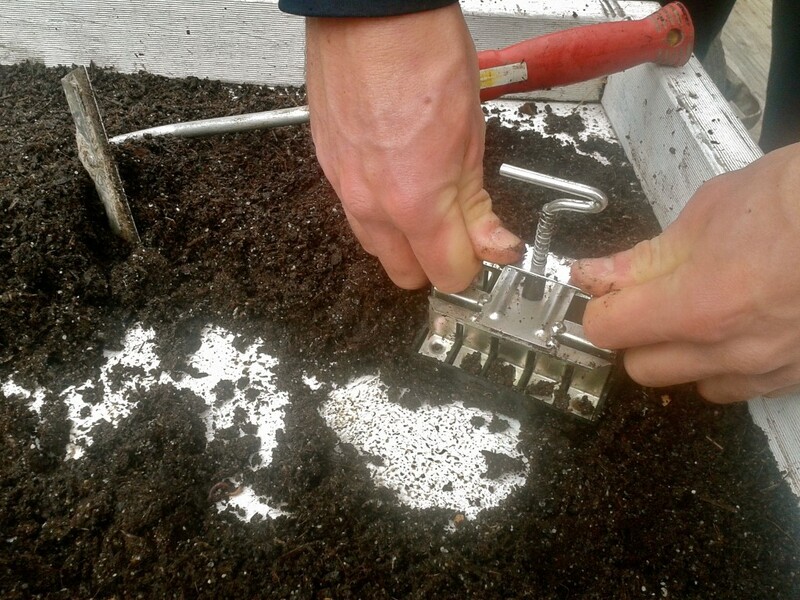 We used the smallest blockers as we were planting out a whole bunch of tomato seeds (which are tiny and don’t need much space). 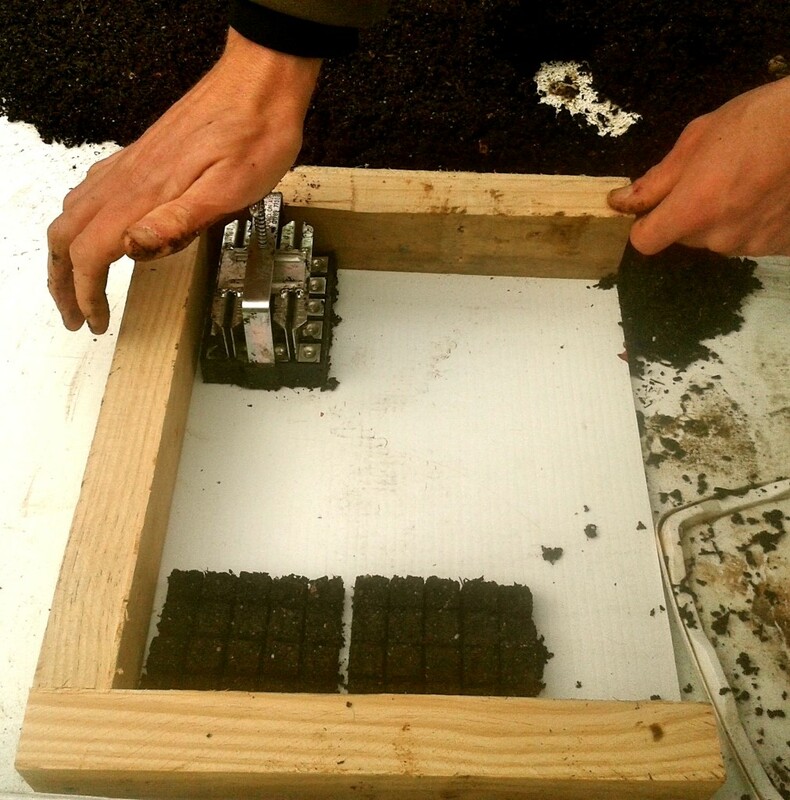 Other plants may be best to start in some of the larger blocks. There’s a bit of technique involved to make a good ‘block’, it requires a firm, yet gentle hand and a bit of caution. But after a few goes you’ll have you method sorted and pump them out. 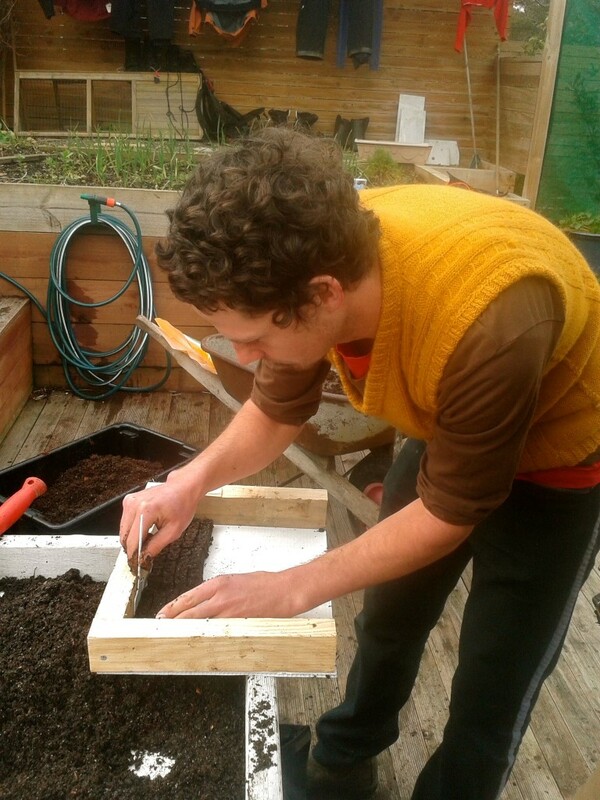 You can plant your blocks directly into a standard tray or make your own. James whipped up a whole bunch of these great planting flats made from timber and corflute which are super easy to stack to transport around. The downside to this design is the lack of airflow which means you can have some fungus growing on the timber. As a result we’ll be transferring the blocks into standard trays to increase the air flow factor shortly. A little trick to be mindful of is to dunk your soil blocker into a bucket of water in between each ‘blocking’. This ensures that the blocks can slide out easily without getting caught on soil bits left behind from last time. Once your blocks are all laid out you can plant your seeds. If you look closely you’ll notice that each block has a little hole in the middle – this is created automatically when you do the blocking and is designed for the seed to be placed perfectly in there. Once you’ve done so you can come back with a dusting of soil mix to cover them up and water them in using a spray bottle/mister thing. A couple of weeks later and they’re now ready to be upgraded to the next size block – yay! 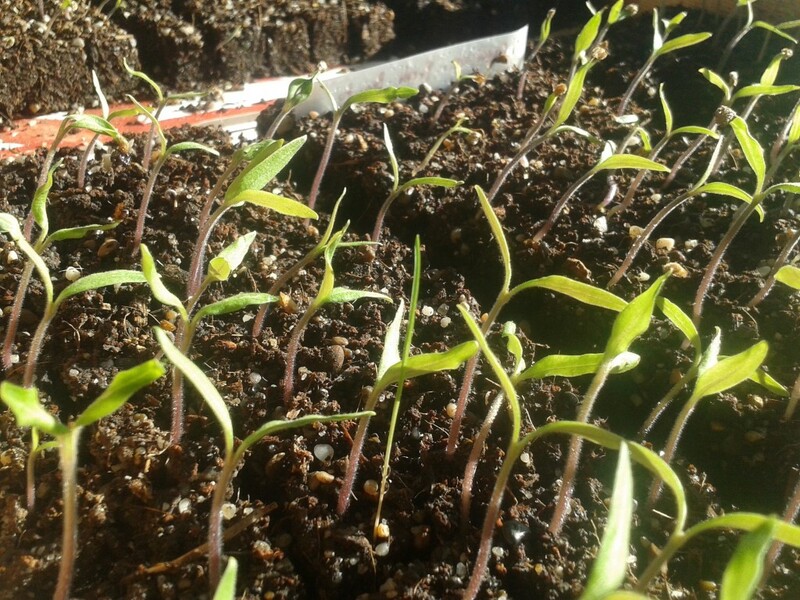 However, due to having some older seed, some of them aren’t quite ready to move up a size yet, but that’s ok we’ll just have them at varied stages which isn’t the end of the world. Soil blockers are one of those life changing tools which can save you bucket-loads on time and provide you with a superior product. We love their low-tech style and the results you get, so many wins with these gadgets! 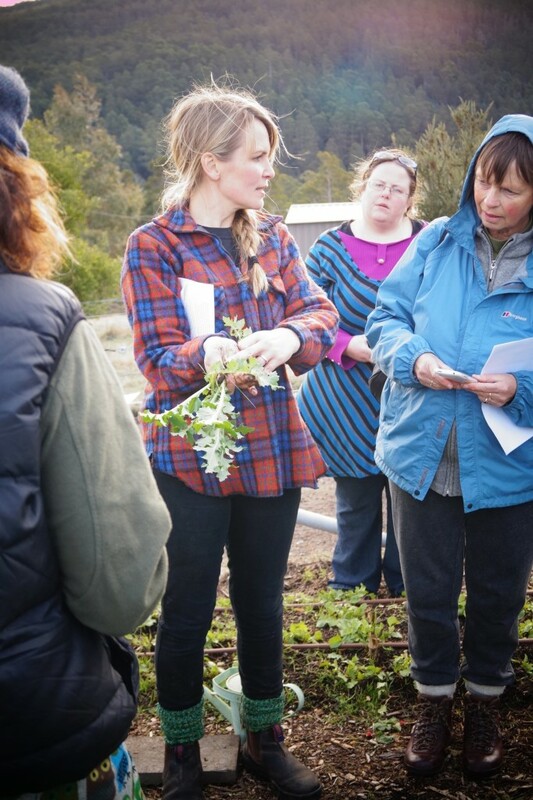 *Your blogger is Hannah Moloney, co-director of Good Life and lover of all things fun and garden-esk. 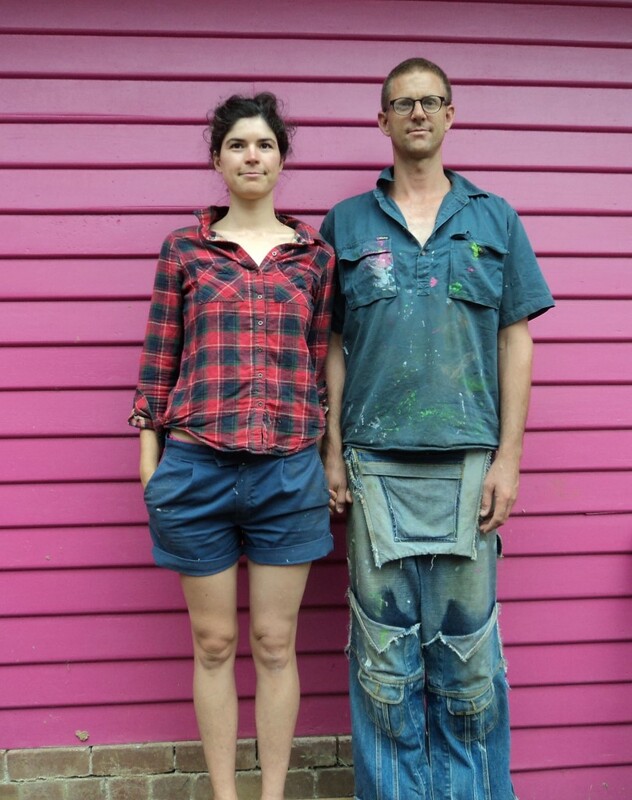 The floppy fence is a type of fence designed to primarily keep possums, wallabies and rabbits (and other undesirables) out of your food garden. We’re a fan of this low-tech, effective system which can be easily replicated in most contexts. 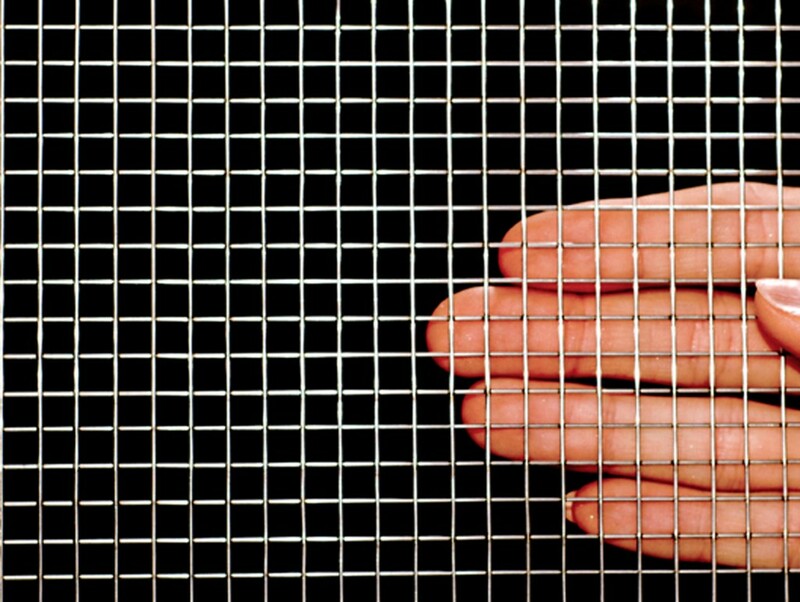 The material list is fairly straight forward and easy to source, it includes chicken wire (rolls at either 1.8m high or two rolls at .9m high), star pickets (at least 1.8m high), tie wire, high tensile wire and vermin mesh or small chicken wire (optional). As a general rule I try to avoid using any timber posts as possums can climb them much easier compared to steel posts. If you have particularly vigorous possums you might want to consider eliminating 100% of any timber from your fence line. In our current home we’re using timber corner posts as the possums in our area are pretty tame. 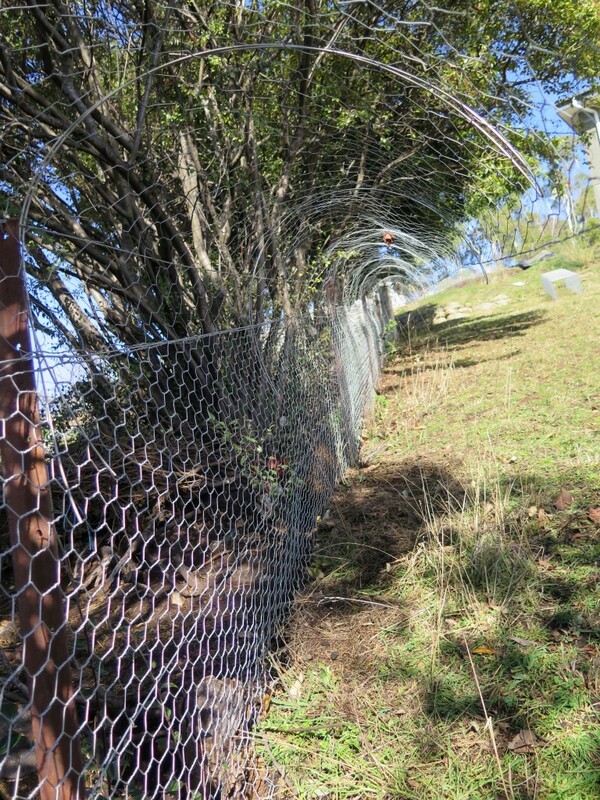 Depending on the area you’re fencing the cost will vary – fencing isn’t cheap and it can quickly add up. However you can salvage a lot of the materials or find them second hand which helps keep the costs down. 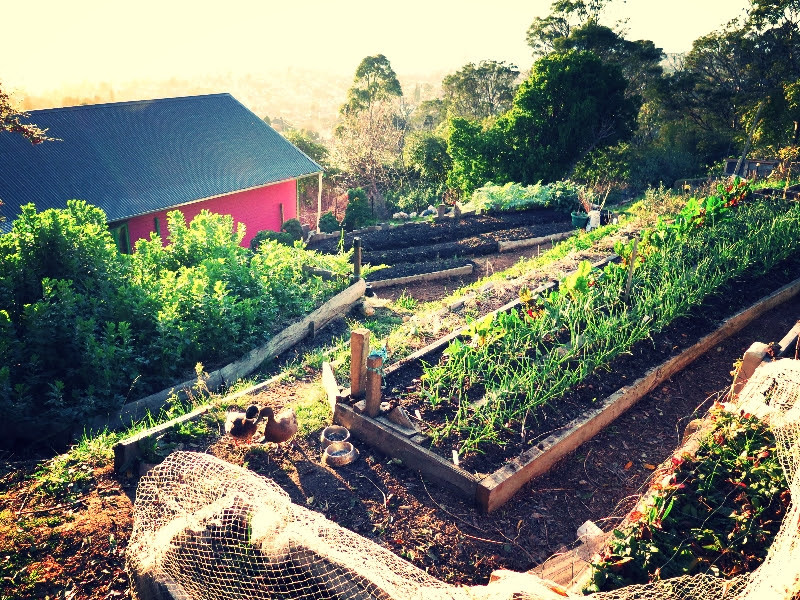 Just remember that long-term, it’s well worth the investment in time and finances as it results in a safe and productive food garden. 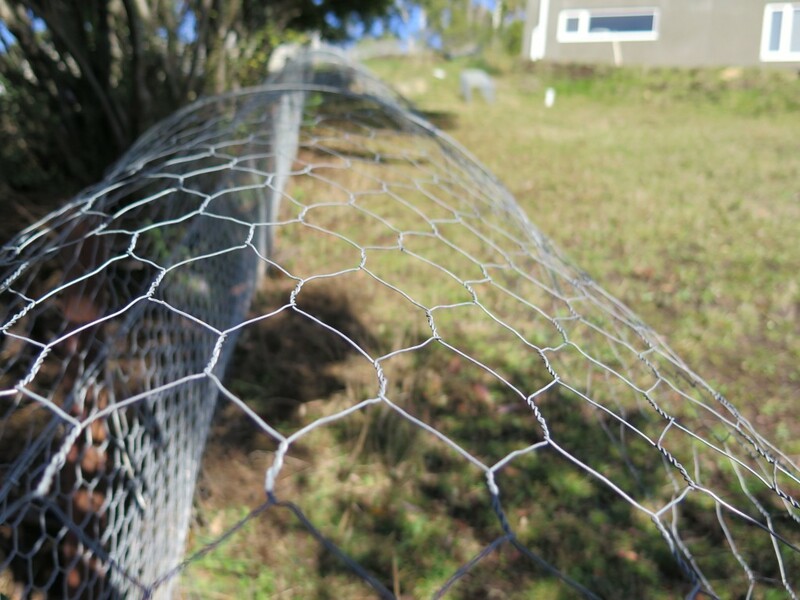 At the bottom of your fence dig in an additional 20-30cm of chicken wire straight down into the soil, this will create a barrier to the rabbits digging under/through the fence. 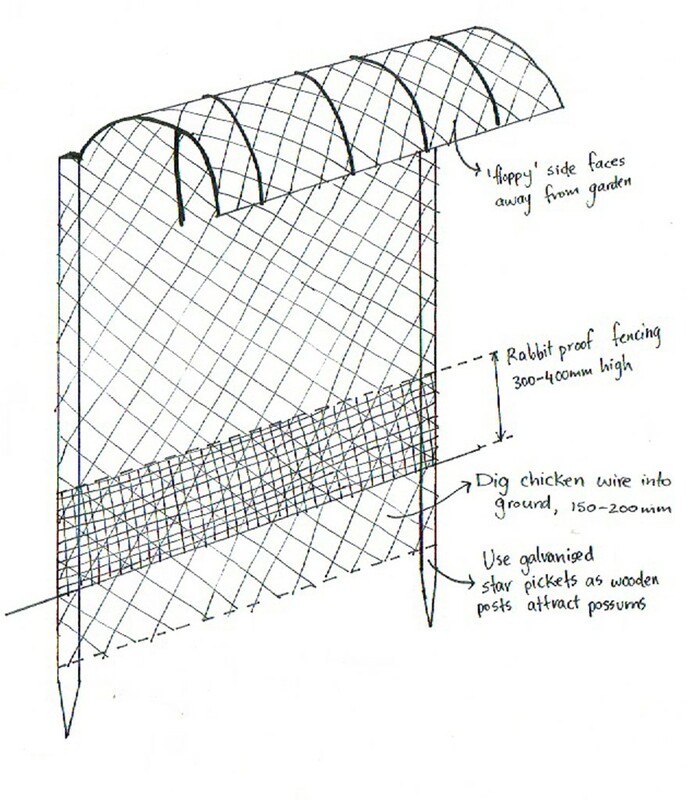 Alternatively you can put a 20-30cm ‘skirt’ on the bottom of your fence where, instead of being dug into the ground the wire is fanned out along the soil’s surface. Something to be mindful of is BABY rabbits who can squeeze through extra small fencing wire. You’ll see on the diagram above that additional wire has been added to the bottom strip of the fence to deter these babies from waltzing into your garden. 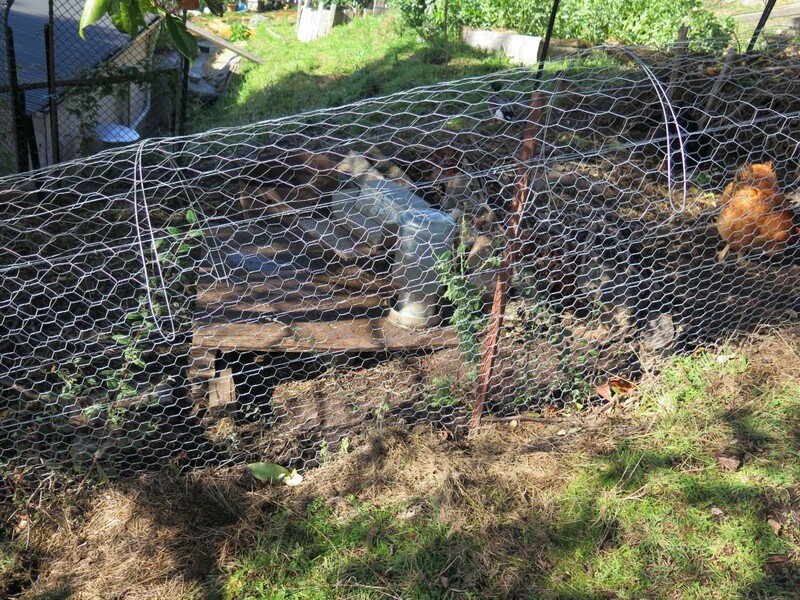 This is where you can use either vermin mesh or small chicken wire to keep them out. The element which prevents possums from rampaging in your garden is the top floppy section. Possums hate climbing on unstable, shaky branches – so we’re imitating this with the floppy top. They’ll climb up the fence like normal, but once they reach the top floppy section they’ll turn around and retreat. Simple! The wonderful thing about wallabies is they don’t jump very high – yay! Technically all you need is a standard fence up to approximately 1.5m high – that’s it. No floppy top or skirt required. Currently most of our garden is only fenced with this standard fencing approach which is keeping the “hoppies” out brilliantly (touch wood). To see this all in action: You can watch a short video I helped make for a floppy fence I co-built at the Source Community Garden which shows you what this all looks like. There are quite a few variations of the floppy fence which people do, it all depends on the materials available and the context in which they’re working. 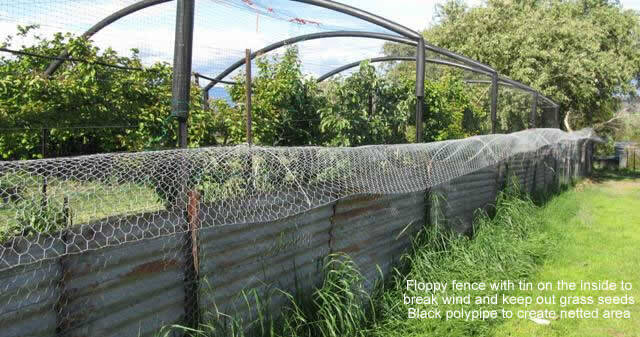 For example Pindari Herb Farm have incorporated corrugated iron into their fence structure to act as a wind/seed break. I’ve also seen this used to keep out wombats, but you have to dig the iron into the soil a good .5m as well. One very important this to realise is that the height of a floppy fence will vary drastically depending on the vigor of your possums/wildlife. 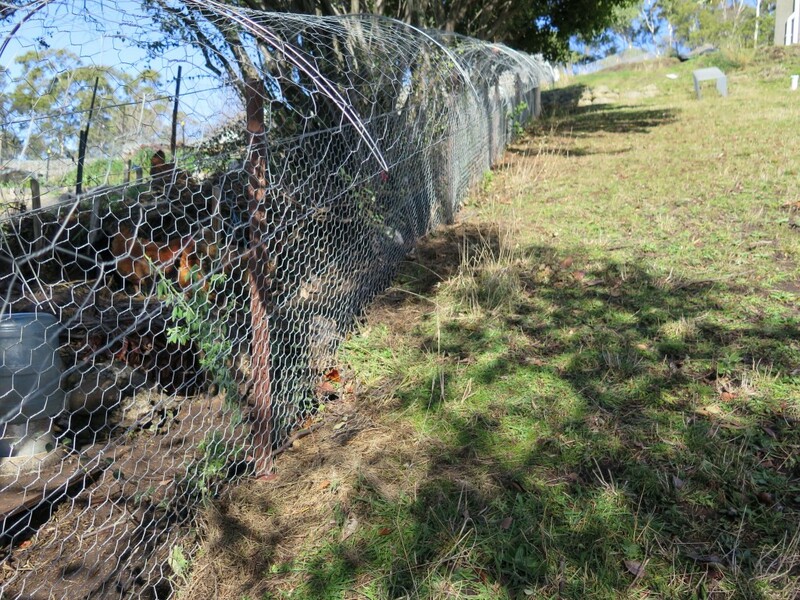 For example we live in urban/peri-urban Hobart and our floppy fence is around 1.5m’ish high, however we know people living in the country who build theirs well over 2m high with an electrical wire on top of that to keep out the possums. Please have no illusion about possums – there are some hard hearted ones out there who will stop at nothing to get to your crops. It seems the possums in our neighbourhood are just a bit more relaxed and casual… For which I am eternally grateful. The main thing to remember is that fencing is your friend, get over any ‘oh, but fences create a bad vibe’ feelings you might have. Do what you need to do to make sure you can grow food without a constant battle with the wildlife. I’ve seen too many half-hearted attempts at fencing which has resulted in huge amounts of energy, time and resources being wasted and ultimately people decided that growing food is ‘too hard’. Generally it’s not too hard you just need to consider the right fencing design for your situation and get into it! 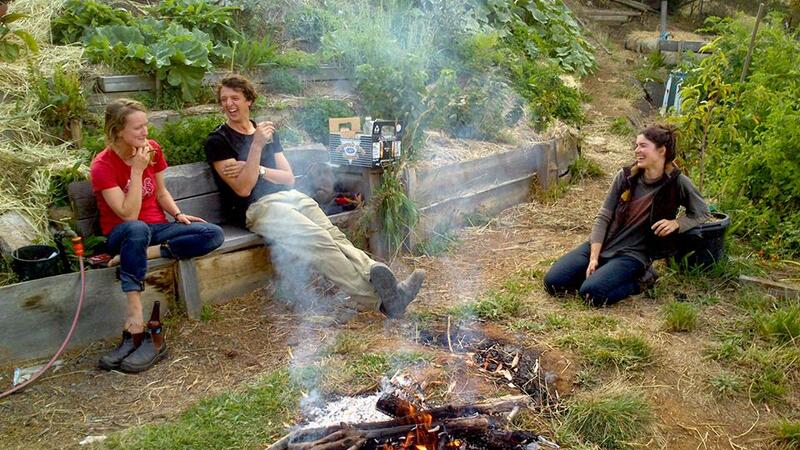 What actually happens on a Permaculture Design Course? Well, lots of things – both planned and spontaneous and all good. Being a design course, we focus on design and creating designers out of all the students we work with – that’s our key focus and priority. 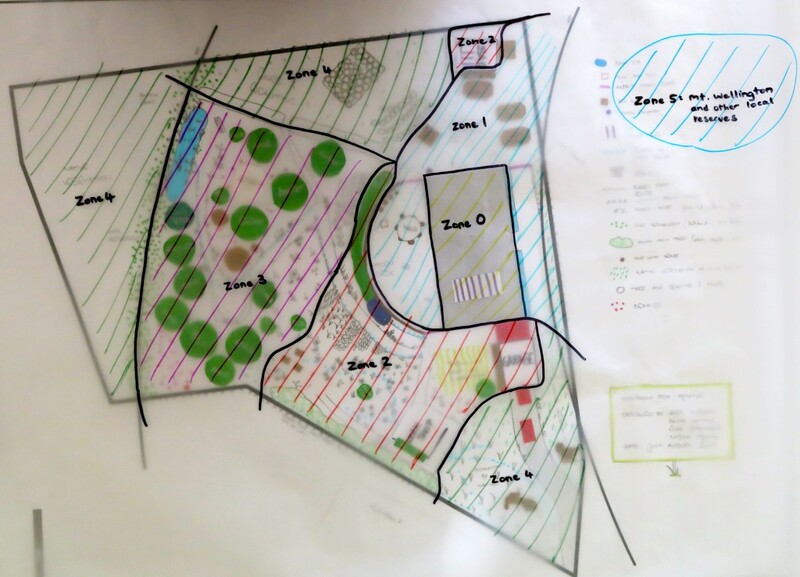 To support good design we integrate practical activities and site visits throughout the course… But at the end of the day we focus on design. 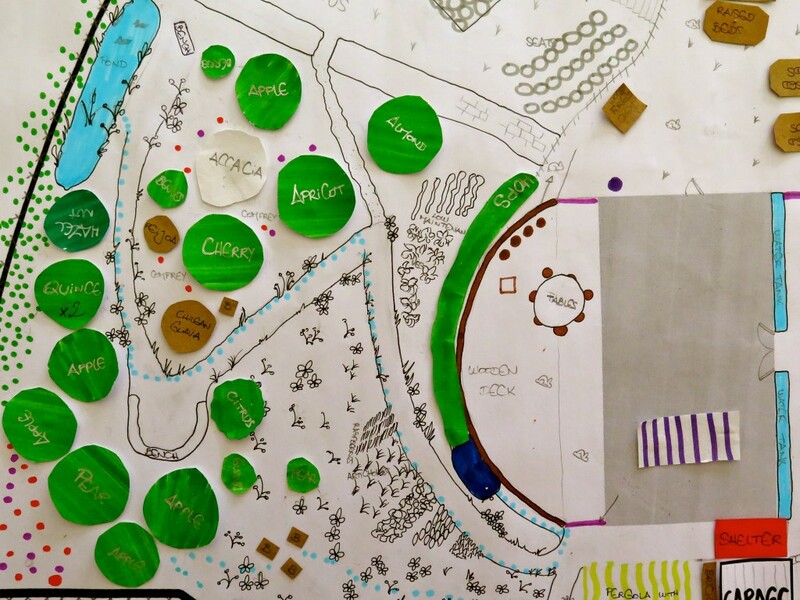 Here’s a snapshot of our current part-time Permaculture Design Course which we’re half way through, and loving. The students have just completed their first ‘practice run’ design projects, here’s a look at a couple of them in process and completed. 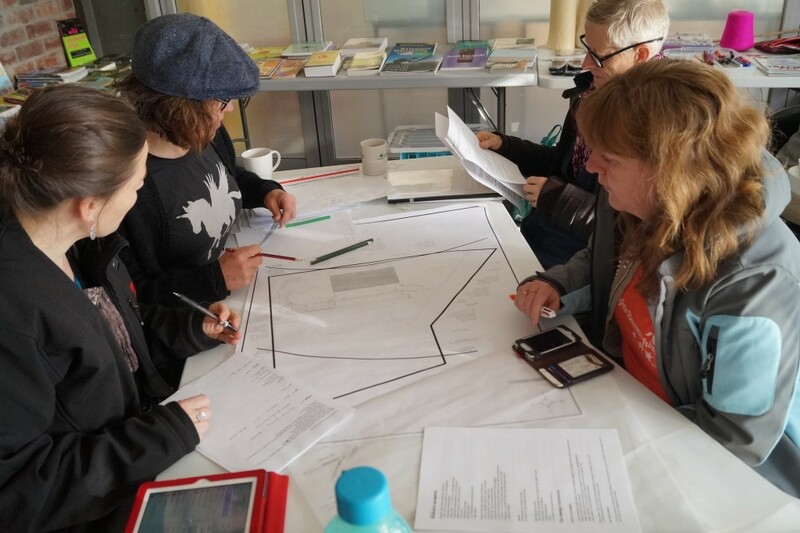 The group design task provides students the opportunity to apply the theory they’ve learned in the first half of the course and gets them ready for their second design task where they can refine their learnings and create magic. And a couple of close ups of the finished result, we are so impressed with the quality of our students work in applying the permaculture ethics and principles onto real landscapes in their first design project. So impressed. We’re really looking forward to their second solo design task, where we know great things will happen. Our current course is a part-time one so students have been finding ways to work together on their group designs (which they’ve just presented) in between our weekends together. One group created a blog where they stored their information and added to it as their design progressed. The final version of their design and associated support documents aren’t all uploaded yet – however it’s a great indication into what a design consists of, you can have a look here. 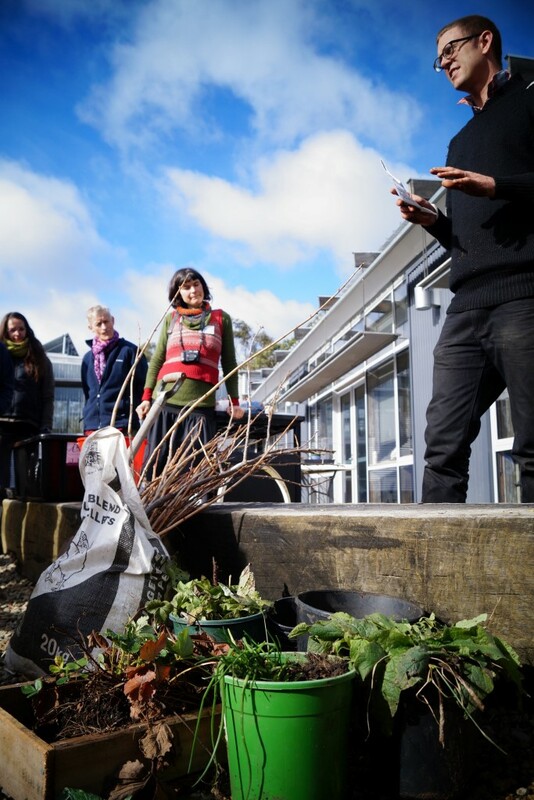 When we’re not inside focusing on design theory, you’ll find us outside learning practical skills that support good design and implementation…. 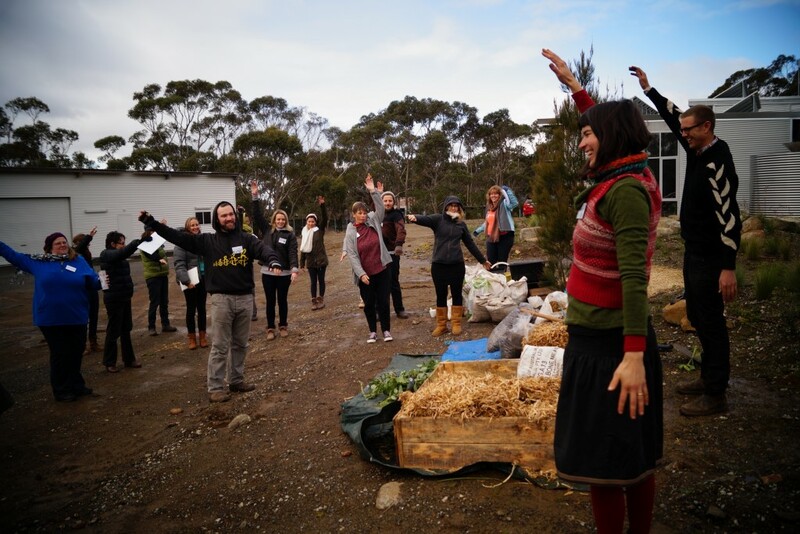 Like aerobics – everyone knows you need aerobics in your life as a permaculture designer, duh. 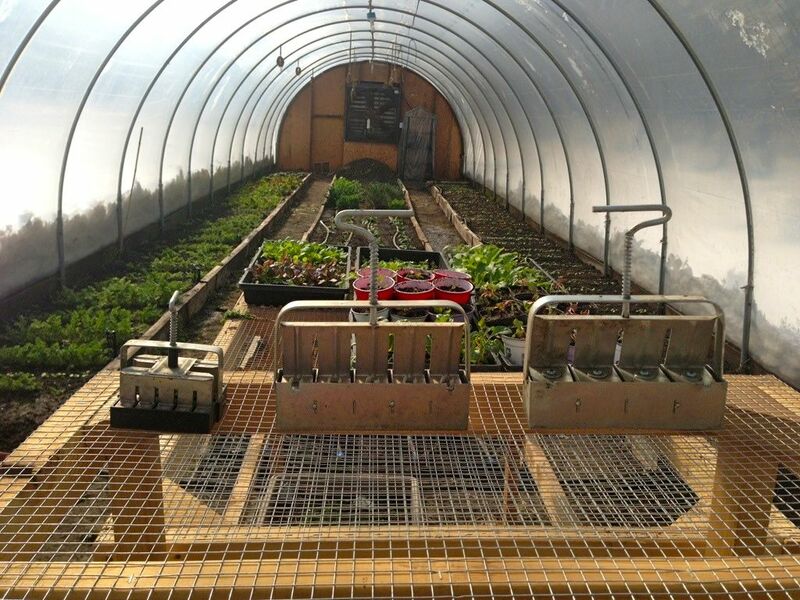 Other practical activities we’ve been exploring include propagation of which there are many, many types. These are basic and powerful techniques which will save you big bucks and see you collecting cuttings and seeds everywhere you go. We’ve taught both low-tech (A-frame and the bunyip level above) and high-tech (laser level) methods in finding and marking out contour lines. 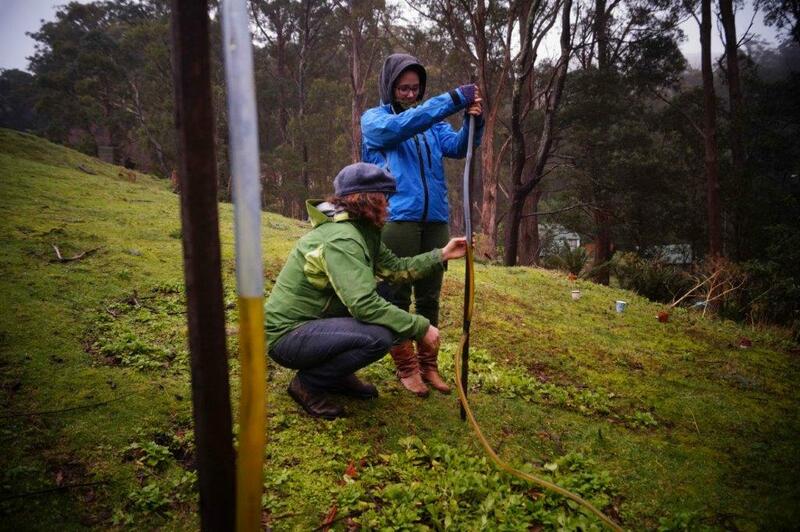 Here you can see Caroline and Nysha learning the ways of the bunyip level, aka the water level. 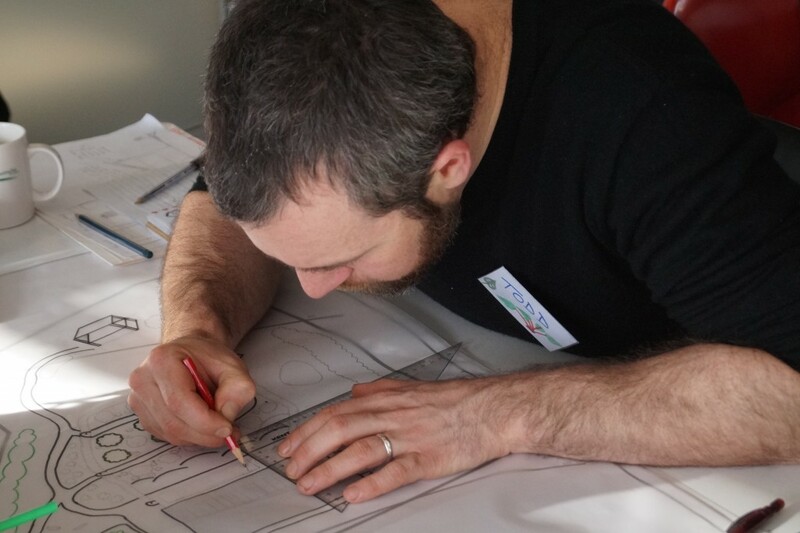 Where ever possible we make sure we teach a range of options for what tools and methods you can use so that even if you’re working with a tiny budget you can get the job done. Soil testing! 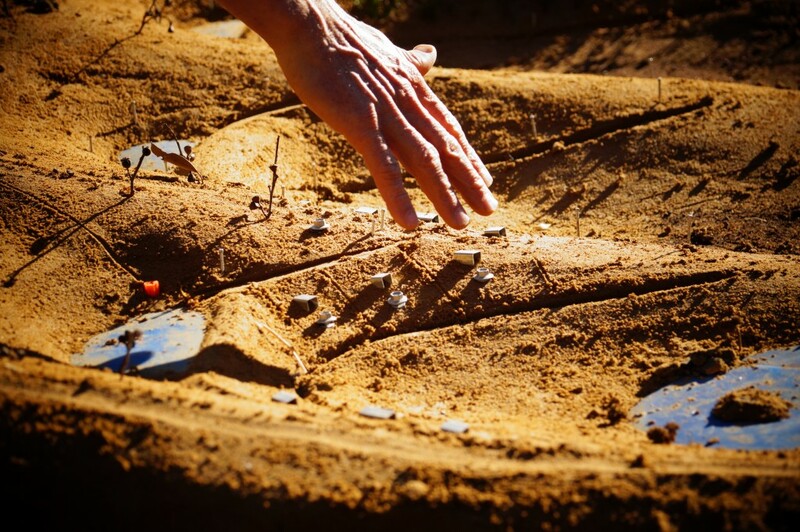 Knowing simple techniques to test and analyse your soil means that you can get to know a new site quick smart and determine how you might approach the land. 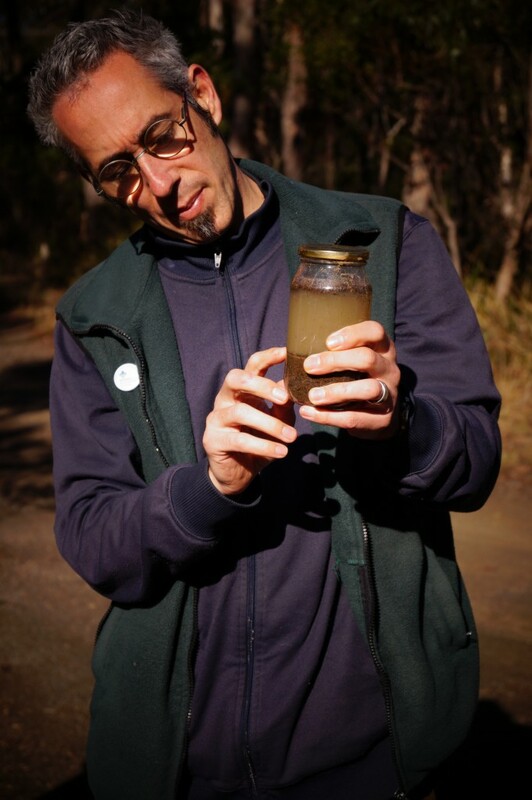 Above you can see support teacher, Nick Towle, teaching students the jar test, while below the trusty pH soil test provides an indication of where your soil’s at. In addition to these two, the ribbon test is another technique we play around with. When we can’t physically take you to the types of landscapes we’d like to show you, we make them instead. Below David Holmgren (yep, that’s right David Holmgren) talks students through keyline water management theory and systems. 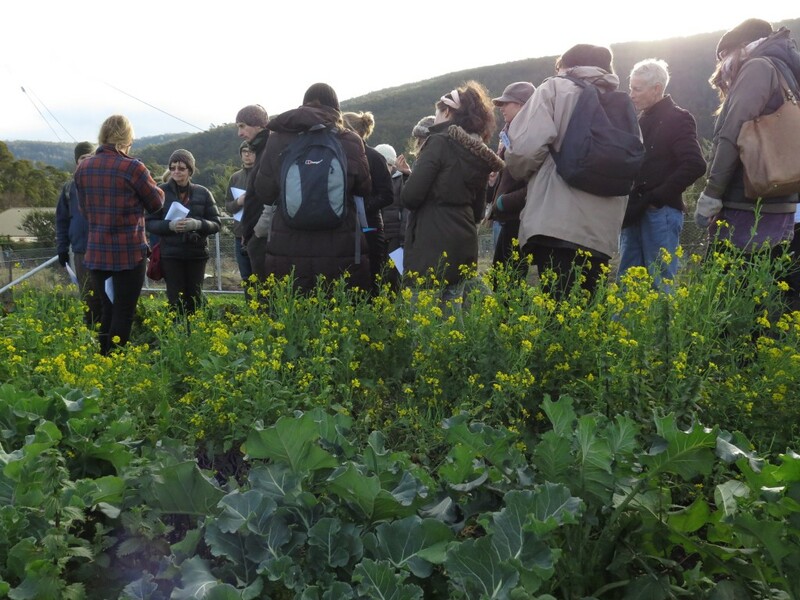 We also take students out and about to show them real life permaculture sites in development and other great people who are seriously rocking it in terms of creating productive landscapes and viable, meaningful livelihoods. This is so important as it shows theory in action and also provides a reality check into the amount of work, time and commitment involved to establish and maintain productive, healthy systems. Good Life’s homestead. 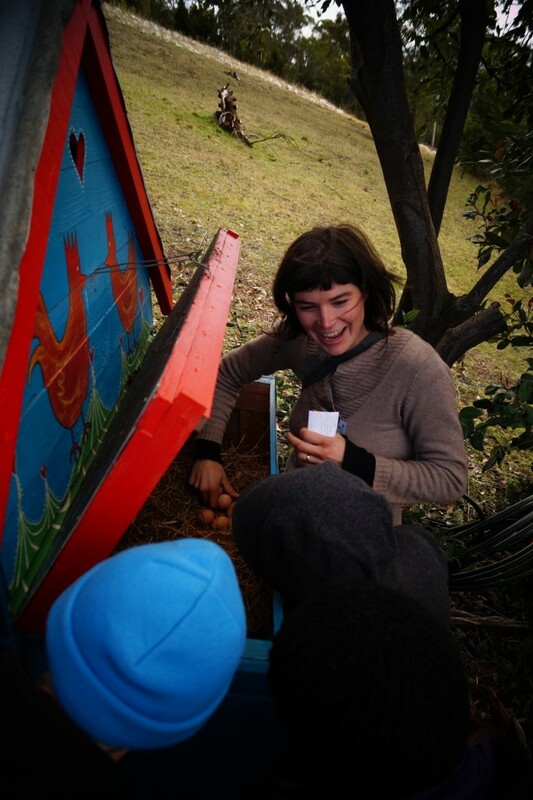 While checking out our chook house, we realised our chickens are back on the lay after a long winter hiatus – huzzah! That paddock in the background is actually our neighbour’s property. Paulette Whitney and her family’s farm – Provenance Growers. 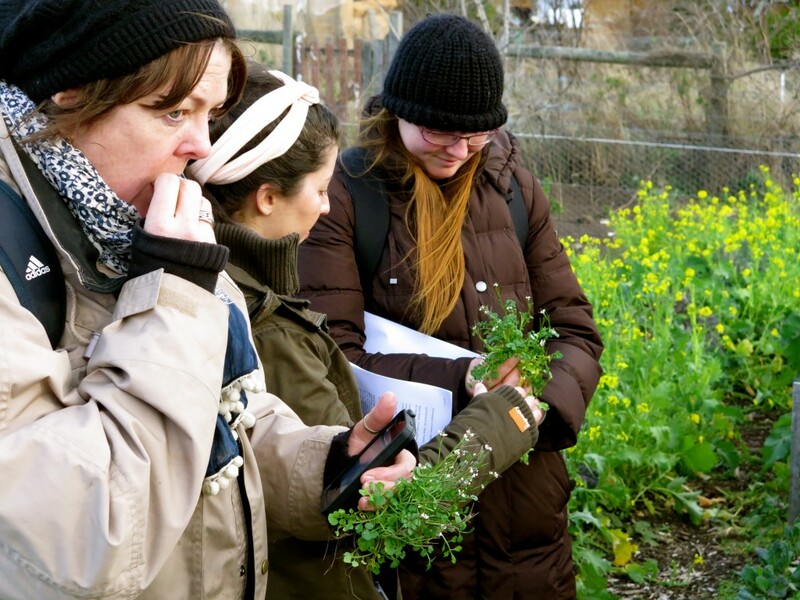 Paulette took us on an edible weeds tour throughout her market garden, where she also cultivates more traditional greens, herbs and vegetables. 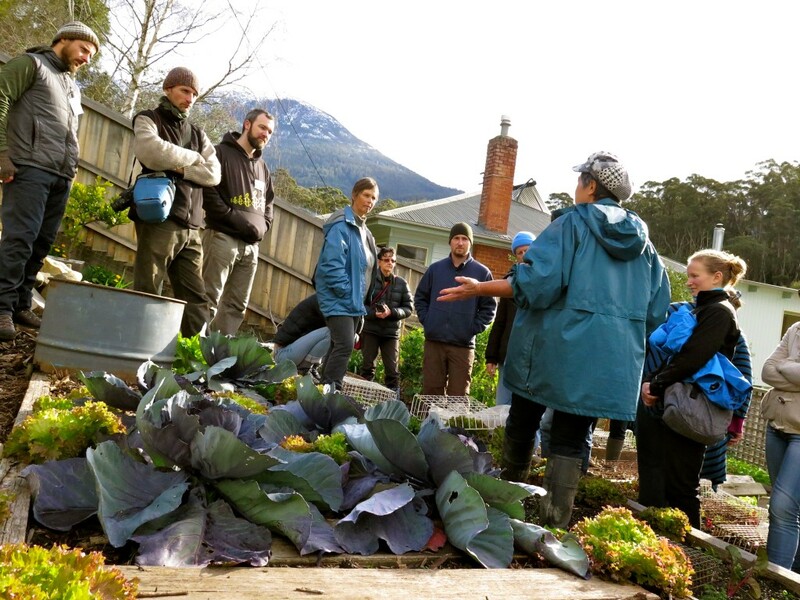 And then there’s Suzi’s market garden in urban South Hobart. 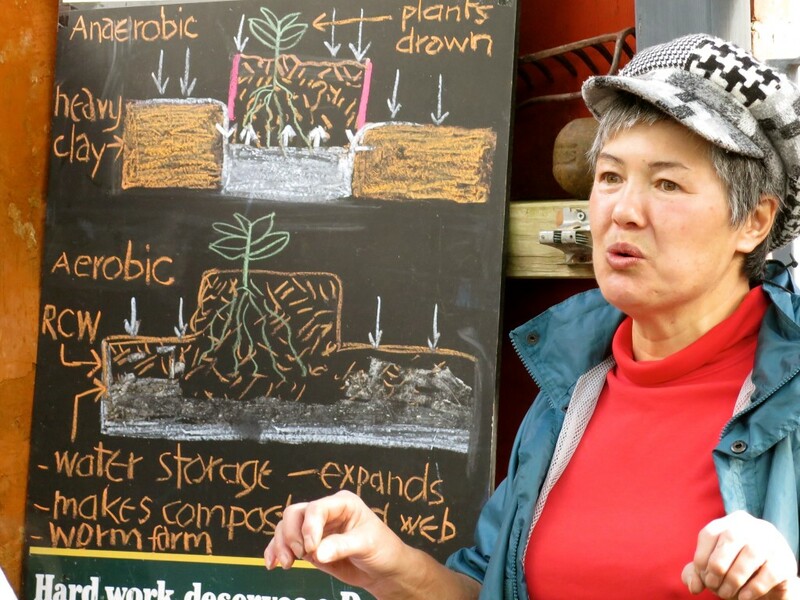 Suzi is a force of nature and a bloody good gardener with a particular focus on soil health… as all good gardeners tend to have. 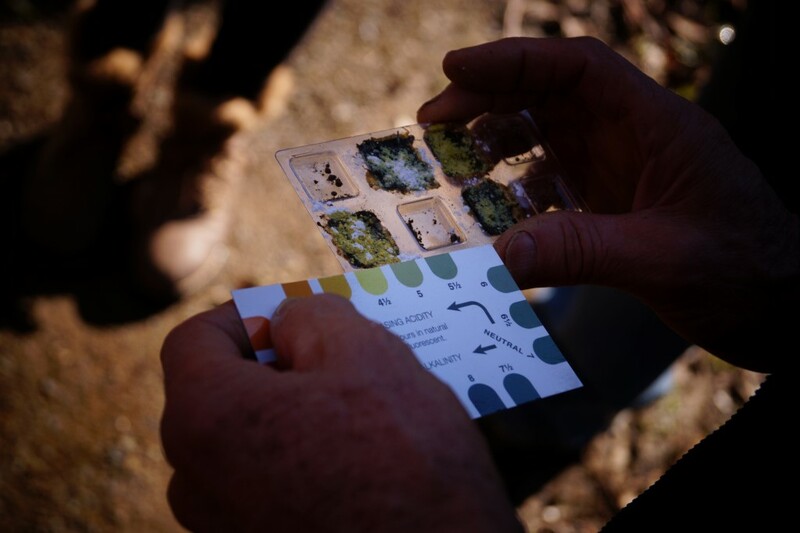 Suzi practices what she calls forest floor gardening – we like it so much we did a little write up about it which you can read here. 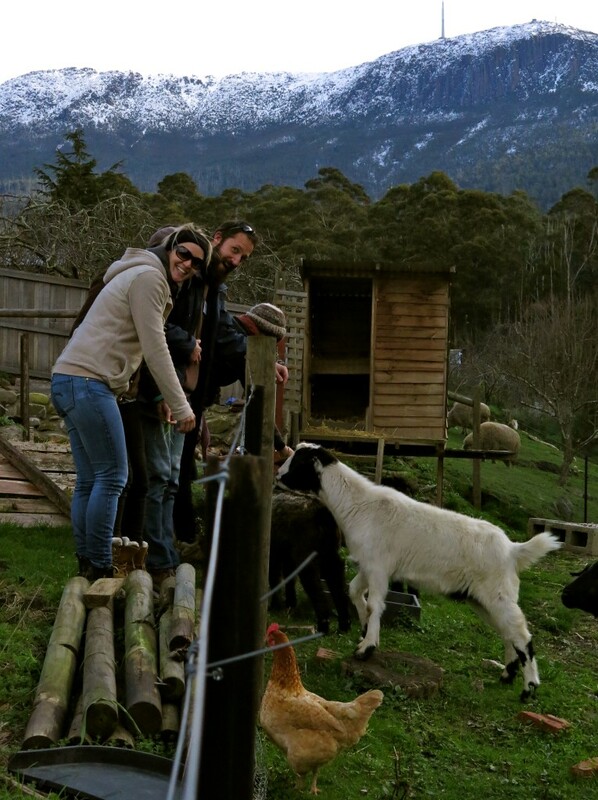 Suzi also has 5 incredibly friendly goats (one which is pregnant with twins – oh the cuteness) and chickens which we couldn’t pull the students away from. Those sheep in the background are on the neighbour’s land. Other unplanned things that happen on a Permaculture Design Course are usually the divine, golden moments that warm your heart and make memories you’ll never forget. 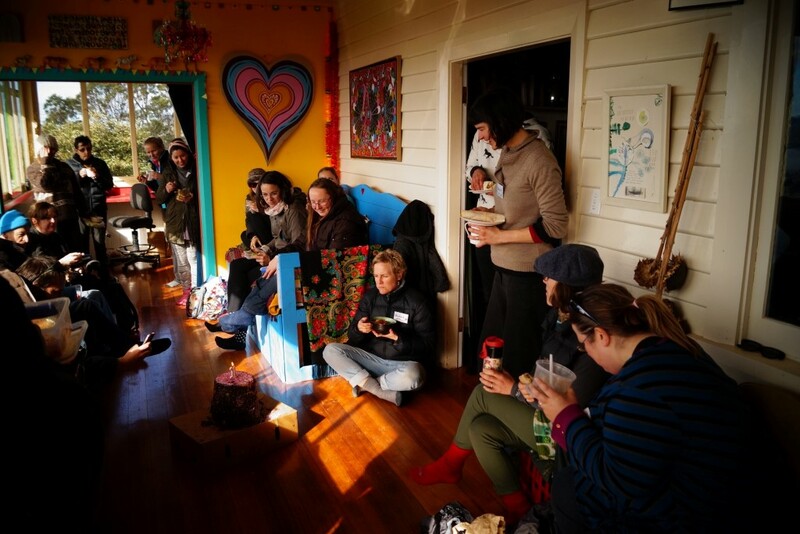 Like the one below, where our students presented us with a compost cake while visiting our home to celebrate Good Life’s first birthday. As far as we’re concerned, this is the most beautiful, incredibly awesome present we could have every hoped for! 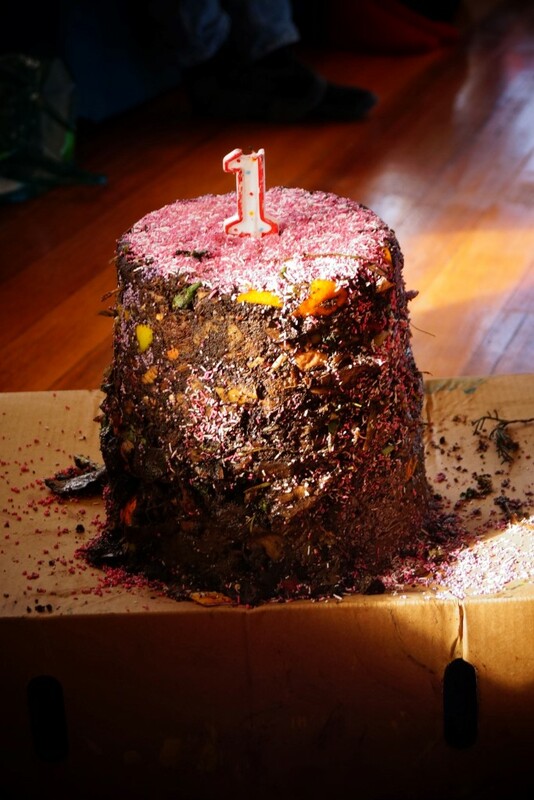 The compost cake in all its glory. It’s moment’s like these that I remember I have one darn fine life. 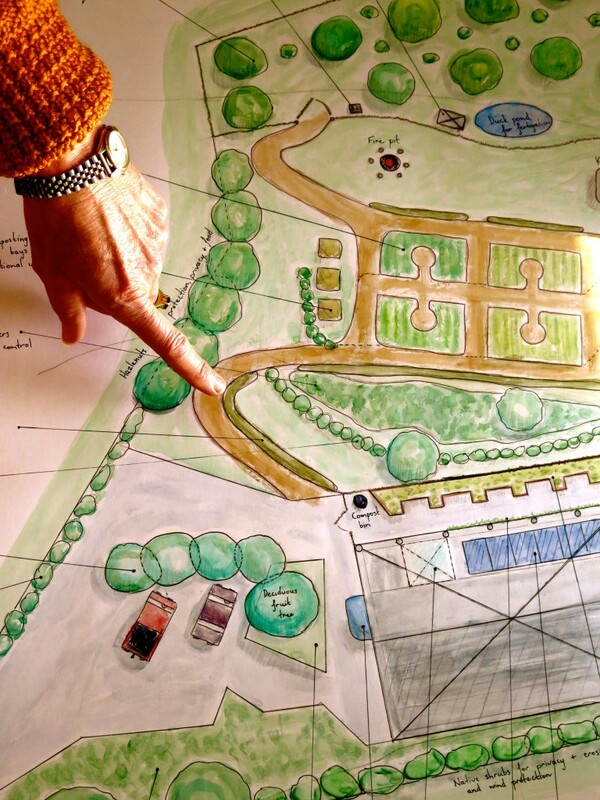 We run Permaculture Design Courses regularly throughout the year, both part-time (as the one above it) and 2 week intensives. You can see what’s coming up here, sign up to our newsletter and like us on facebook to make sure you hear about them first.